I have a strange one, a client scans documents from their MFD to a folder within the Public area on a Windows 10 machine, up until last week they were able to access the folder using \\MACHINENAME\USERNAME\Public\Scans network address with no issues, now no one in the office is able to access the share. I am thinking that the root cause maybe Norton Internet Security. When I go into Control Panel > Network &Sharing Centre > Advanced Settings and look at the Guest of Public Section; Public Folder Sharing is turned off, and Password Protected Sharing is set to on. When I try to change these options to On and Off respectively and click on "Save Changes" I get no error message but when I go back in to check the settings they have reverted to their previous setting of Off and On. I have tried to disable Norton Protection to allow me to make these changes but to no avail. Does anyone have any ideas what could be causing this issue? 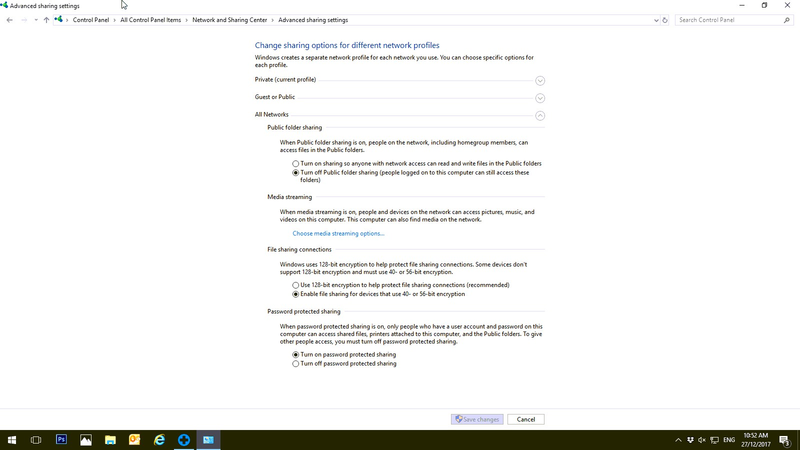 In the Network and Sharing settings from your image, try changing the Private network settings as that is your current profile. Be sure that the Turn on Print and file sharing is enabled.